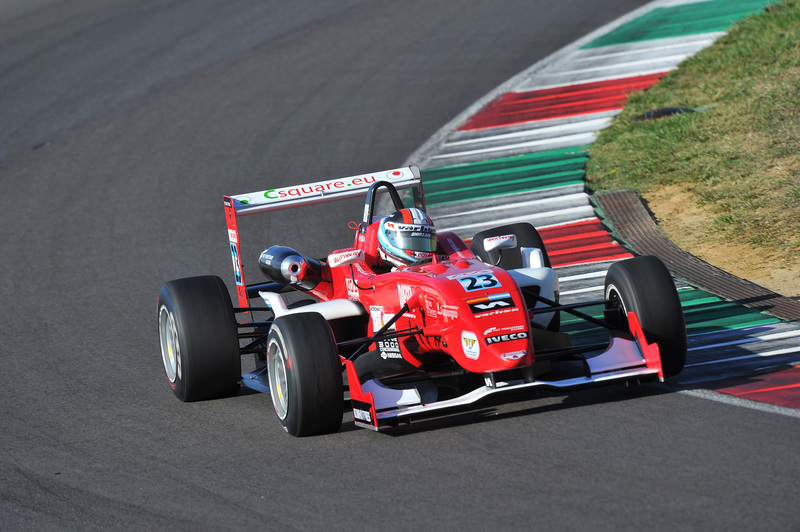 01/10/2011 - The front row of the grid valid for race one of the seventh and penultimate round of the Italian Formula 3 on stage at Mugello will all be wearing the Ghinzani red. Thanks to the laptime of 1´39.226, at an average speed of 190.292 km/h, the Argentine Facu Regalia set the pace during the whole session and managed to win the duel with his mate, at the team led by the former Formula One driver, Edoardo Liberati. 203 thousands of a second separate the leading couple in a session that saw Liberati faster than is team mate in the first sector but giving away precious hundreds in the third sector of the lap. Michael Lewis was 23 thousands slower than Liberati and the Californian driving for Prema Powerteam managed to obtain the third place of the grid in the final part of the session, overtaking the Brazilian Victor Guerin (Lucidi Motors) ending fourth after holding the second position in the first stint. The top five is all within three tenths and is closed by Raffaele Marciello (Prema Powerteam) that was just one hundred of a second slower than the South American but with a little more than two tenths of advantage to Eddie Cheever (Lucidi Motors). The classification leader Sergio Campana (BVM-Target) did not manage to find the right rhythm in free practice but managed anyway to secure the seventh position that can be precious especially in race two starting with the top eight grid inversion; at his side will start Kevin Giovesi (Lucidi Motors), eighth and less than six tenths from the poleman. Ninth at more than half a second from Giovesi and at 1.1'' from Regalia was Brandon Maisano (BVM-Target) leading his team mate davanti Maxime Jousse, tenth for just a hundred of a second. Andrea Roda (Prema Powerteam), Federico Vecchi (LineRace-CO2) and Simone Iaquinta (JD Motorsport) follow with less than 2 seconds from the pole, while the rookie Edoardo Bacci (LineRace-CO2) followed after them in 14th. Regalia's laptime improved by nearly three seconds the 2010 record set by Andrea Caldarelli (Prema Powerteam) in 1´42.088, at 184.958 km/h. The resurfacing of the Tuscan track already allowed the monstre lap by Michael Lewis in the private tests held last March in 1´38.989 at 190.748 km/h. Race one is scheduled for 16.05 while race two will be at 10.10 tomorrow morning (local time, GMT+2). As usual, the two races will be live on Italian TV on freeview and satellite channel Raisport 2.